Good news! I just posted the 1st Quarter Project Report for The Big Book of Maps for Tabletop Roleplaying Games reflecting on the first 90-days of the project since the Kickstarter funds cleared. As of this morning I have posted the 100th map! This means that the project is officially past the halfway point, and less remains to be done to complete the project than has already been completed. The project is 100 days ahead of schedule so I have already completed all of the work scheduled for the next quarter -- and then some! I have been creating (at least) one full-page map for the project every single day for the past two months. Bank, Blacksmith, Cellar, Church with Bell Tower, City Bakery, City Infirmary, Corner Pub, Dock Warehouse, Fletcher & Archery Range, General Store, Grain Bin, Guard Garrison and City Gate, Herbalist and Apothecary, Hovels and Abodes (x3), Indoor Bazaar, Inn, Jeweler, Latrines & Outhouses (x3), Library, Magic Shop, Merchant Kiosk (x5), Museum, Pawn Shop, Planned Domicile (Apartments), Potter's Shop & Kiln, Public Bath House, Shanty Town Shacks (x7), Sheriff's Office with Gallows, Small City Park, Taverns (X2), Theatre with Balcony, Town Courthouse, Village Stables, Well Shed, and Windmill. Literally everything needed to completely flesh out a fully-mapped city! More than half of the "Underworld" two-page spread mega-dungeons have been done as well. I have also made updates to the Digital Distribution Tool. Most notably a new "Most Recent Map" preview on the sign-in page. I hope this new feature will be useful for those who have been visiting frequently to download maps during the week. Now you can see if a new map has been released since your last visit without having to login and navigate to the map downloads. 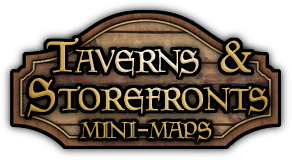 I also added several inline banners for my new VTT Maps Patreon.